The Estwing RPESTM No-Mar Rubber Flooring Mallet features a lightweight fiberglass handle and a white no-mar rubber head, making it ideal tool for installing both prefinished and unfinished flooring. Use the mallet to tap your flooring into place without fear of scratching or denting your new floors. This replacement mallet for the EFL50Q and EF18GLCN pneumatic flooring nailers is built with high-quality materials to provide long-lasting durability. Lightweight fiberglass design weighs under 3 lbs. Tbook.com crawls the web to find the best prices and availability on Estwing and related Tools and Hardware products like Estwing No-Mar Rubber Flooring Mallet. For this page, related items include products we find that match the following keywords: "Estwing" at our vendor partner Home Depot. 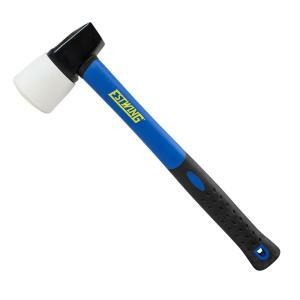 Estwing No-Mar Rubber Flooring Mallet is one of 156 Estwing and related products listed in the Tools and Hardware section of Tbook.com If you have any questions on this product, please give us a call at 734-971-1210 during the hours of 9am - 5pm EST for assistance. Thank you for shopping at Tbook.com, the Internet Department Store!